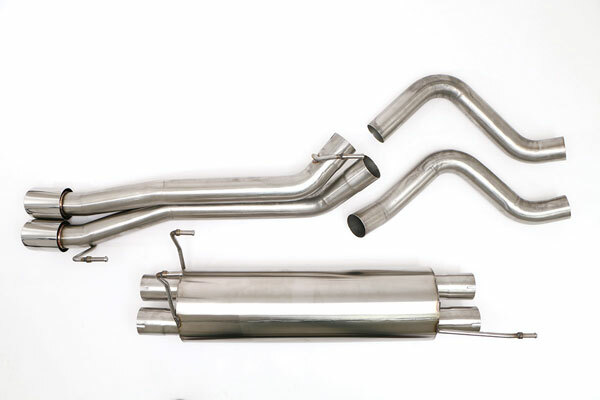 B&B Billy Boat Exhaust FTRU-0440 - B&B Exhaust System Dodge RAM SRT-10 Truck 4 TWIN ROUND DOUBLE WALL TIPS; 2004-2005. Billy Boat offers a 50 state legal, 3” cat-back system producing a max 18 horsepower and 24 lb.-ft of torque. Mandrel bent from the same premium grade stainless steel, this system is upgradeable to include the front section with the high-flow cats. Completing the system are twin 4” fully-polished double wall tips for an aggressive yet stylish look. Both exhaust systems offer astonishing performance gains and a deep, commanding sound that is only found in a Billy Boat Performance Exhaust. As with all B&B products, the system is backed by a limited lifetime warranty. FTRU-0440 Features: 4 Twin ROUND Double-Wall Tips. Mandrel bent from the highest-grade T-304 stainless steel. Designed, tested, and manufactured to the finest hand-made integrity found in any exhaust system. Below are other popular parts other customers have purchased for their Dodge Ram Truck SRT 10.